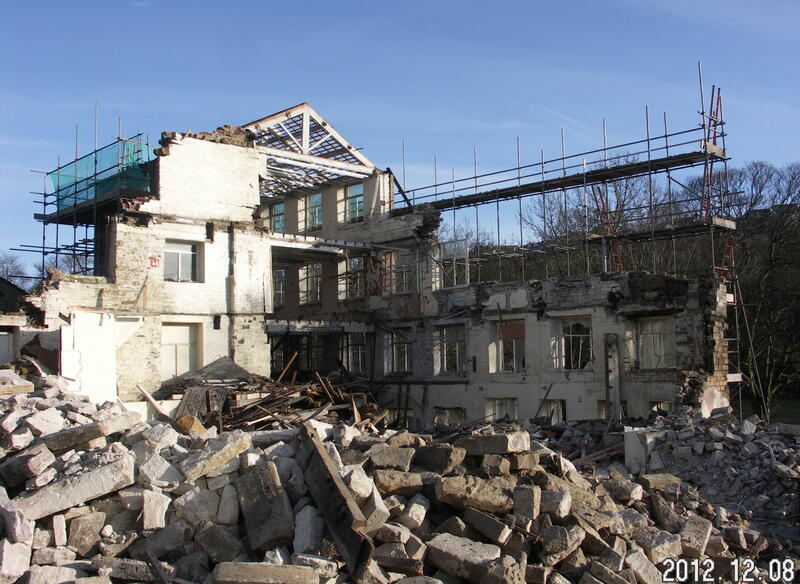 Bridge Mill, Holmfirth’s oldest remaining mill, which survived fire and flood in the nineteenth century, has disappeared to make way for a supermarket. The mill which was built on land between the Woodhead Turnpike Road and the River Holme was a notable landmark on the approach to Holmfirth. According to research by local historian Mike Day, for his forthcoming book on ‘Textiles in the Holme Valley’, there was probably a fulling mill on the site since Tudor times. By the mid 1700s there was also a corn mill and drying kiln owned by Samuel Haigh of Marsden. The water powered mills had a plentiful water supply both from the Holme and the Hebble Dyke and, by the end of the eighteenth century, scribbling engines were installed on the premises. When the mill was advertised for sale in 1811 it was described as a ‘Large Commodious Building now used as a scribbling Mill’ tenanted by Jonas Roberts and William Cuttell. The large stone quoining on the lower storeys of the structure recently demolished may be a remnant of this early building. A five storey building was added to the complex, being described ‘of recent erection’ when the mill again appeared for sale in 1849. Around this time Joseph Broadbent took over part of the mill, employing 50 people. During the Holmfirth flood of 5 February 1852 his willow room was destroyed, pieces of cloth ruined and the wall of the dam destroyed. In 1987 human bones discovered by workmen excavating the dam were believed to be those of one of the flood victims. The dam was again damaged by a flood in 1866. 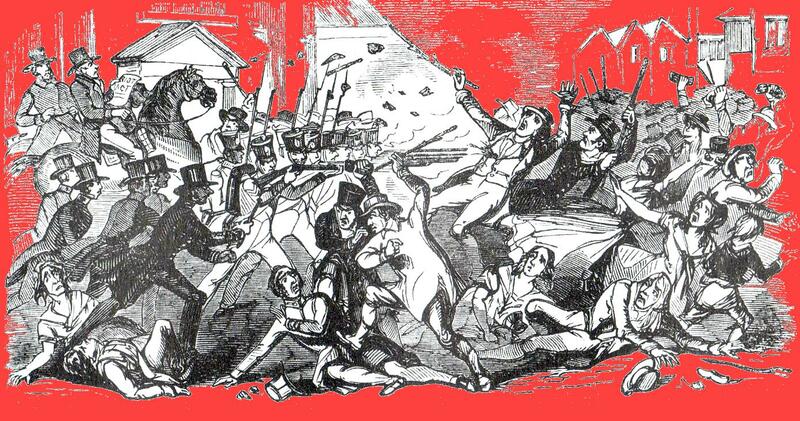 In 1857 Broadbent’s premises almost burnt down. On 6 June there were two fires on the same day ! The first, in the wool stove, was soon extinguished but another in an attic room required the calling out of the new ‘Unity’ fire engine from Holmfirth – the first serious test of the crew’s ability. The mill’s bell summoned crowds of people who formed a chain to pass cans of water from the reservoir at the other side of the road . The fire raged for over a hour but most of the building and the adjacent part of the mills, occupied by James Brook, were saved. Broadbent’s suffered another fire in 1859 when cotton in a teasing machine ignited, injuring the boy operating it. By 1870 the mill had its own fire engine, the Excelsior. 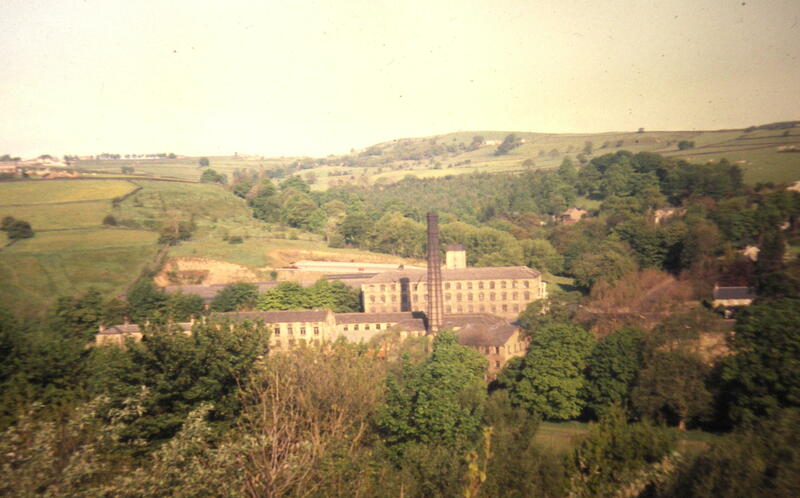 James Brook later moved his business to Bradley Mills at Huddersfield and his part of the mill was taken over by Joseph Senior. When the mills were sold again in 1861 two buildings were described, one the ‘Old Mill’, adjoining Woodhead Road, of four storeys, and a spinning factory, of three storeys. The mill was powered by a steam engine of sixteen horse power and a waterwheel of over nineteen feet diameter. In 1865 when Joseph Turner built a new warehouse at the opposite side of the road to the main mills, it was described as, ‘the most stately warehouse in the neighbourhood of Holmfirth.’ This is now the only part of the mill still standing. Up to the First World War the mill was occupied by James Hinchliff and Sons, woollen manufacturers, George Greenwood cloth finishers and James Watkinson & Sons. When it was sold by auctioneers Eddison, Taylor & Booth in 1916 it realised £6,100 for the four storey mill, two three storey mills, water rights and land totalling four acres. The last textile firm to operate from the mills was Walter Gledhill & Sons Ltd, who produced woollen and worsted suitings under the trade name ‘Holmvale’. They went into receivership in 1965 and closed with the loss of 200 jobs. The demolition of Bridge Mills marks the loss of another unique monument to our textile history. This book must, with no doubt, be the definitive work on the textile industry in the Holme Valley. However, it is not merely of local interest, since by focusing in detail on this particular area it also contributes to our understanding of the Yorkshire textile industry as a whole. It is comprehensive in detail and monumental in scope. It traces the origin of the woollen industry from domestic production to the origin and rapid development of mills and factories along the river Holme and its tributaries. Every mill known to exist is traced and detailed mill by mill biographies are pieced together covering all aspects of life and work. The sources used are wide ranging, including some new discoveries such as the Beardsell Diaries, while even familiar sources such as the Wakefield Court Rolls are carefully examined afresh. There are also chapters covering particular themes such as the political background, child labour and trade unions which puts the mills in the broader context of the textile industry. There is also a new detailed account of the Holmfirth Flood of 1852, which affected so many mills in the area. The book brings to life not only the technology of woollen and worsted production but also the people involved – the lives of both manufacturers and workers are vividly depicted in the face of fire, flood, machinery accident, bankruptcy and all the other trials and tribulations faced by those in the industry. The only criticism this reviewer has is that some of the detail, less central to the story, could have been relegated to footnotes, or appendices, since it breaks up the narrative – however, readers can mentally do that for themselves if at times they feel the massive amount of information is too much to take in. Having said that, the detail is neither superfluous nor redundant and this is a stylistic quibble rather than a criticism of the research. This is a holistic, well rounded account by someone who has an informed understanding of how the textile industry operated and is not a mere ‘run of the mill’ one dimensional description of the local trade. It is a work of academic quality, carefully referenced and annotated and, particularly as it is Michael Day’s first book, constitutes both a great personal achievement and a magnificent contribution to the history of the Holme Valley – and to the woollen and worsted trade as a whole. It is amply illustrated with many photos not hitherto published and, at £16.95 for a book of 340 pages of text, is a bargain and a must-buy for anyone interested in Local History. Just discovered this while trying to find out more about Bridge Mill, Holmfirth, owing to a historical family connection. Back in 1841, my three times great grandfather, Matthew Bashforth, was living there, staying with his older sister Elizabeth and her husband, Charles Belk Marples, who may have been someone of some importance at the Mill. Matthew was not the first of the family, as his older brother George had been there back in 1831 and his family were still in the area, though he himself had died in 1838. Nearby lived a younger brother Thomas Bashforth and his wife. All three men were metal workers of one sort or another, constantly on the move in search of work. Matthew had left his family in Sheffield at this time and had previously tried to find work in the USA with his older brother William. Hard times and they didn’t get any better. Thanks for this. Thanks for the information, Martin. Glad you find ‘Wool & Worsit’ useful. Mike Day had done a great job on it and crammed as many names as he could into it so it would be helpful to family historians as well as textile history enthusiasts.